Let's keep'em in Afghanistan Iraq Syria "a little longer," the Pentagon said on Thursday of US troop presence in the war torn country after a fierce debate within the administration was triggered last week over President Trump's announcement that he intended to order a quick withdrawal of US forces. Or rather, perhaps it was more of an establishment beltway "pile on" in reaction to Trump's policy shift than a debate. There are some 2000+ officially acknowledged soldiers occupying northern Syria working closely with the Kurdish YPG-dominated Syrian Democratic Forces (SDF), and Trump's message even as recently as Tuesday was a firm and confident, "It is time" to get out of Syria, "I want to bring our troops home." But it appears the 'deep state' and career government bureaucrats who seem to ever default toward intervention and military adventurism without end have won out once again. As we noted previously, beltway bureaucrats including the weekend editorial and cable news pundits generally reacted in disbelief and horror with charges of "chaos" leveled at the Trump White House over his planned Syria pullout, and claims that "ISIS will come back" if America leaves. Though nearly six months ago ISIS was widely acknowledged to have suffered utter and overwhelming defeat in all major cities and towns it once held, most notably Deir Ezzor and Raqqa, something confirmed by Syrian and Russian military officials currently leading successful efforts to clean out the last isolated scattered remnants of ISIS resistance - it appears that the supposed "the ISIS threat" is the phantom menace gift that will keep on giving. Now officials both within and outside Trump's cabinet can simply evoke "ISIS!" to argue for the perpetual military occupation of Syria - something now clearly manifest. This in spite of Trump himself along with his generals consistently signalling for months that ISIS is defeated. For example, in December the president acknowledged that "nearly 100 percent of the territory once held by the terrorists in Iraq and Syria" had been recovered, and that at the end of 2017 "we’ll be finished pretty soon with the ISIS situation in those two countries [Iraq and Syria]." Notably, ISIS has been more or less absent from international headlines as well after its defeat; however, the Pentagon is now keen to reinject the threat of "ISIS' return" into public consciousness. Trump has reportedly grown extremely frustrated at the Pentagon's unwillingness to provide a clear timetable for withdrawal. When his advisers told him they needed more time to complete the mission and secure the gains they’ve made, Trump demanded to know how much longer, the senior administration official said. 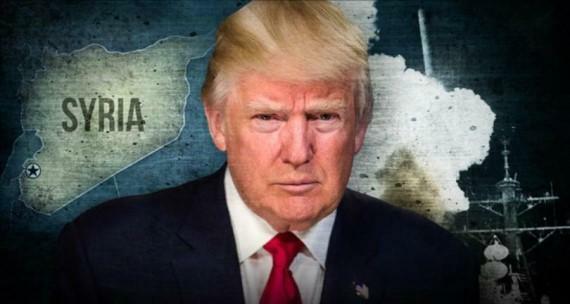 Meanwhile Trump has attempted to extricate US troops from Syria by asking ally Saudi Arabia to foot the bill for postwar reconstruction and "stabilization" projects in the area of northeast Syria currently occupied by US coalition forces, to the tune of $4 billion. He repeated his demands that regional allies step up coordination in Syria during a White House press conference on Tuesday, saying "We've almost completed that task [of defeating ISIS] and we'll be making a determination very quickly, in coordination with others in the area, as to what we'll do." And he continued, "Saudi Arabia is very interested in our decision, and I said, 'Well, you know, you want us to stay, maybe you're going to have to pay'." Now that Trump has given in to Pentagon demands that the US stay in Syria, it will be interesting to see just how long "a little longer" will actually become. Will we be having the same discussion 17 years from now?